Munchkin Czar Andrew Hackard provided the (Not So) Secret Origin of Munchkin Shakespeare, an article focusing on our trip on the Nerd Boat . . . er, I mean JoCo Cruise 2015, and the resulting card ideas crowdsourced from a group of fans. Here, he gives us an answer to the question: Why Kickstarter? And he answered the frequently asked questions about the Kickstarter Exclusive Expansion (recently named Munchkin Shakespeare: Limited Engagement). 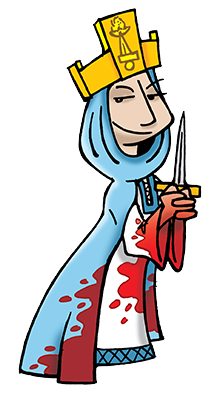 If you're wondering if Shakespeare can mix with other sets, Andrew will put your mind at ease with Munchkin Shakespeare: An Act in Five Plays, which highlights five Munchkin games that would be perfect to mix with it, as well as dungeons from Munchkin 6 and Munchkin 6.5. And it doesn't stop there; you can mix any Munchkin games together, so the options are limitless! We wouldn't want to leave artist John Kovalic out, as he provided Munchkin Shakespeare Art Notes on his Dork Tower site. Learn some background to John's process, and get some card-art previews (not final art) to boot. Geek & Sundry also interviewed John, and gave the campaign a shoutout. Thanks, G&S, for the signal boost! Finally, I gave some details about Munchkin Shakespeare and retailers; how they can be involved with the campaign, and information about the game releasing to distributors. If you had a question, hopefully these articles will help answer it. There are only five days left in the Munchkin Shakespeare campaign, so help us spread the word and unlock even cooler loot!